"On Sid Miller's Facebook, fake news flows freely" was first published by The Texas Tribune, a nonprofit, nonpartisan media organization that informs Texans — and engages with them — about public policy, politics, government and statewide issues. Thousands of Texas Agriculture Commissioner Sid Miller's followers on social media might believe that terrorists are — in his words —preparing "for their jihad against the state and our nation” from a training compound outside of Houston. Some of his Facebook followers might also believe that an apartment complex forced a Texan to take down his American flag for fear of offending Muslims. Or that, during a recent trip to Cuba, a smiling President Obama held a t-shirt displaying Che Guevara, the late Marxist revolutionary. These are just a few of the completely fabricated or otherwise unsupported stories that Texas’ agriculture chief has promoted on Facebook and Twitter. Miller, who is said to be in the running for U.S. agriculture secretary in President-elect Donald Trump’s White House, has gained notoriety for controversial social media postings such as a tweet that called Hillary Clinton the C-word and a Facebook post that endorsed the atomic bombing of the “Muslim world." But at a time of heightened awareness about the power of “fake news” to shape Americans’ perception of politics and policy — and perhaps influence the most recent presidential election — the Republican statewide officeholder also stands out as a prolific sower of such misinformation. “I think probably a few times, you might be right — we got duped,” Miller said in an interview this week, adding that he doesn’t personally post everything to his social media accounts. “Put something up that might not be true. Didn’t do it maliciously." Miller, who said he gets his news “from all over,” said his team tries to respond when it discovers it has shared a fake story. “We take it down, most of the time," he said. A Texas Tribune analysis of a portion of Miller's social media history identified 10 postings of demonstrably false, misleading or unsupported information. The information most often came in the form of a link to an obscure ultra-conservative website posted with commentary from Miller. Some of these posts dated back to late 2014, when Miller was campaigning for his current job. Others were far more recent, including the headline of an apocryphal story about pop star Lady Gaga that he posted last week (see below). As of Friday evening, it had generated 309 comments and 210 shares on Facebook. The former lawmaker and calf roping champion is only modestly influential on Twitter, where he had 5,420 followers as of Friday. But he carries incredible clout on Facebook, where he frequently boasts of his nearly 334,000 followers and counting. Asked whether his social media team should more carefully vet the truthfulness of its postings, Miller cut the interview short. Below are 10 examples of fake stories or memes shared by Miller’s social media accounts. As of Friday morning, none of them had been removed. Reuters visited Islamberg, which the news site described as “small enclave of Muslim families living on shared land.” That report added: “Experts and law enforcement officials contacted by Reuters dismissed the idea that the group has violent intentions.” Business Insider and the Washington Post have also examined the claim of a network of terrorist camps in Texas and elsewhere and the lack of evidence behind them. A reporter for the left-leaning Dallas Observer visited the Sweeny neighborhood and found Muslim residents that “include a former police officer, an-ex constable, an ER nurse” and blue-collar workers. “It looks more like a small community of rundown homes and older trailer houses,” the story reported. Despite Miller's call for state officials to arrest people in Sweeny, no such action appears to have taken place. The Texas Department of Public Safety told the Tribune in an email: “The department does not have any information to provide” about the site. Texas man forced to take down American flag because it presented a "threat to Muslims"
The rumor-debunking website Snopes.com rates the claim in this story that Miller circulated in September as "mostly false." While a Texas man did claim that his apartment complex made him take down his American flag because it presented a "threat to Muslims," no one else substantiated that reasoning. Instead, the complex's management, which flies its own American flag at its entrance, objected to the way the man hung his flag — from his balcony. This photo is fabricated, Snopes notes. The original was taken seven years before Obama traveled to Cuba last March, and the shirt he held actually displays math jokes. More than two years after Miller shared this post, it was still on his Facebook page Friday, even after Snopes debunked its claim, as did — surprisingly — the Trump-backing website Breitbart, which Miller’s account often otherwise links to. While a woman was beheaded in Oklahoma, no Muslims protested at a press conference. A commenter on Miller’s post wrote: “They should have all been shot on sight!” Another wrote: “Kick these muslim idiots out of the country! They are NOT WANTED here." Miller’s account liked both comments. Miller shared this video last September. The notion that Hillary Clinton’s campaign first spread the false theory that President Obama was born in Kenya and therefore never eligible for the presidency has been debunked repeatedly over the years. Politifact explains that Clinton supporters appeared to have started the murmurs, but those Democrats had no ties to her campaign. Snopes rated this claim false, and it included a statement from the Communist Party that explicitly denied that it had endorsed Clinton or any candidates on the ballot. Miller shared the post in August. 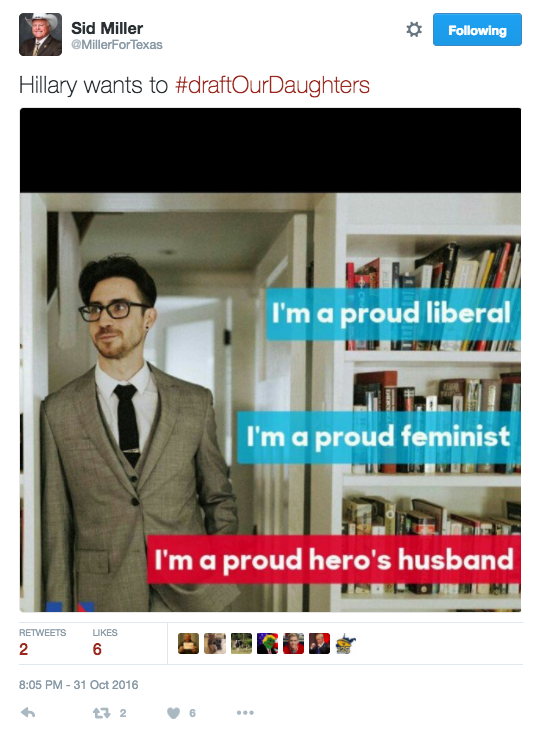 Trump backers created the meme shared in Miller's October tweet as part of an effort to deceive folks into believing Clinton’s was campaigning on this message. Snopes has more details. Clinton has supported the idea that women should register for the draft as men do, while still backing the idea of an all-volunteer military. There is no evidence that Putin ever said this, according to Snopes. Miller posted the meme on Wednesday. Miller shared this video this September, and it shows something very different what the post claims. “It captures a group of Shi'ite Muslims mourning the death of Imam Hussain at the culmination of a procession for Arbaeen,” a sacred Shiite ritual, Snopes details. Lucy Nashed, communications director for Texas Agriculture Commissioner Sid Miller, resigned after the agriculture department gave contradictory reports on whether Miller had used state funds to compete in a rodeo. During his first year and half in office, Agriculture Commissioner Sid Miller's conduct ranged from the cartoonish to the potentially criminal. 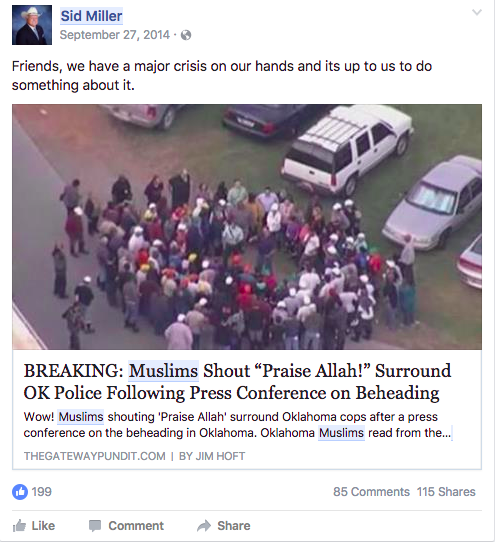 On Sid Miller's Facebook, fake news flows freely By Jim Malewitz December 3, 2016 Thousands of Texas Agriculture Commissioner Sid Miller's followers on social media might believe that terrorists are — in his words —preparing "for their jihad against the state and our nation” from a training compound outside of Houston. Some of his Facebook followers might also believe that an apartment complex forced a Texan to take down his American flag for fear of offending Muslims. Or that, during a recent trip to Cuba, a smiling President Obama held a t-shirt displaying Che Guevara, the late Marxist revolutionary. These are just a few of the completely fabricated or otherwise unsupported stories that Texas’ agriculture chief has promoted on Facebook and Twitter. Miller, who is said to be in the running for U.S. agriculture secretary in President-elect Donald Trump’s White House, has gained notoriety for controversial social media postings such as a tweet that called Hillary Clinton the C-word and a Facebook post that endorsed the atomic bombing of the “Muslim world." But at a time of heightened awareness about the power of “fake news” to shape Americans’ perception of politics and policy — and perhaps influence the most recent presidential election — the Republican statewide officeholder also stands out as a prolific sower of such misinformation. Read More Analysis: In new media age, every reader has to be an editor “I think probably a few times, you might be right — we got duped,” Miller said in an interview this week, adding that he doesn’t personally post everything to his social media accounts. “Put something up that might not be true. Didn’t do it maliciously." Miller, who said he gets his news “from all over,” said his team tries to respond when it discovers it has shared a fake story. “We take it down, most of the time," he said. A Texas Tribune analysis of a portion of Miller's social media history identified 10 postings of demonstrably false, misleading or unsupported information. The information most often came in the form of a link to an obscure ultra-conservative website posted with commentary from Miller. Some of these posts dated back to late 2014, when Miller was campaigning for his current job. Others were far more recent, including the headline of an apocryphal story about pop star Lady Gaga that he posted last week (see below). As of Friday evening, it had generated 309 comments and 210 shares on Facebook. The former lawmaker and calf roping champion is only modestly influential on Twitter, where he had 5,420 followers as of Friday. But he carries incredible clout on Facebook, where he frequently boasts of his nearly 334,000 followers and counting. Screenshot of Sid Miller Facebook post Miller told the Tribune that he wasn’t closely listening to the national discussion about the impact of fake news. “I wouldn’t say I was following it,” he said. “I saw some headlines on it.” Asked whether his social media team should more carefully vet the truthfulness of its postings, Miller cut the interview short. “Look, if you’re going back and looking at Facebook posts from over a year ago, and looking at comments, about whether they were liked or not, I know where you’re headed, and I think this conversation is over,” he said. “Look, you’re trying to make up the news, and not report the news. I don’t appreciate that.” Below are 10 examples of fake stories or memes shared by Miller’s social media accounts. As of Friday morning, none of them had been removed. 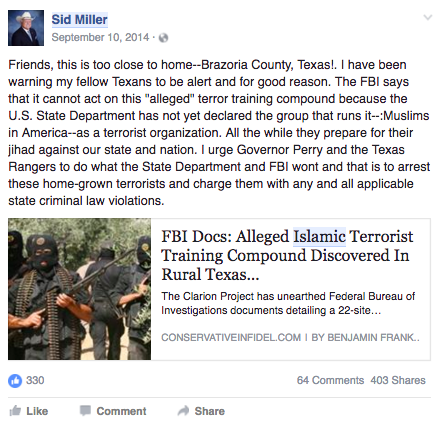 Terrorists are training in Brazoria County Screenshot of Sid Miller Facebook post In this two-year-old post, Miller links to the website conservativeinfidel.com. The accompanying photo – a 2008 snapshot of Palestinian soldiers owned by Getty Images – was not taken in Texas. Tracing the source of the site's claim that there is a terrorist training camp in the small city of Sweeny leads to websites like Weaselzippers.us (tagline: "scouring the bowels of the internet") and the Clarion Project, which describes itself as “the world's leading website for authoritative, up-to-date news on Islamic extremism, sharia law and human rights.” That website claims that the Sweeny site is part of “a network of 22 'villages' around the U.S., with Islamberg as its main headquarters in New York.” Reuters visited Islamberg, which the news site described as “small enclave of Muslim families living on shared land.” That report added: “Experts and law enforcement officials contacted by Reuters dismissed the idea that the group has violent intentions.” Business Insider and the Washington Post have also examined the claim of a network of terrorist camps in Texas and elsewhere and the lack of evidence behind them. A reporter for the left-leaning Dallas Observer visited the Sweeny neighborhood and found Muslim residents that “include a former police officer, an-ex constable, an ER nurse” and blue-collar workers. “It looks more like a small community of rundown homes and older trailer houses,” the story reported. Despite Miller's call for state officials to arrest people in Sweeny, no such action appears to have taken place. The Texas Department of Public Safety told the Tribune in an email: “The department does not have any information to provide” about the site. 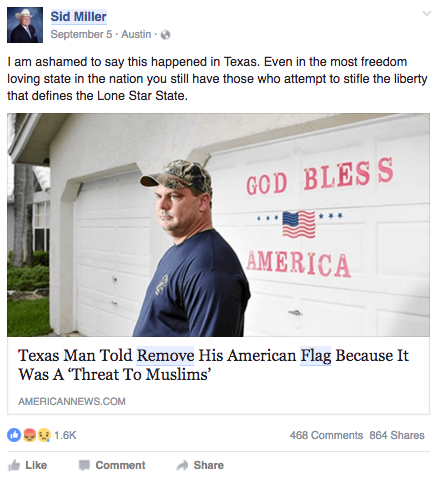 Texas man forced to take down American flag because it presented a "threat to Muslims" Screenshot of Sid Miller Facebook post The rumor-debunking website Snopes.com rates the claim in this story that Miller circulated in September as "mostly false." While a Texas man did claim that his apartment complex made him take down his American flag because it presented a "threat to Muslims," no one else substantiated that reasoning. Instead, the complex's management, which flies its own American flag at its entrance, objected to the way the man hung his flag — from his balcony. 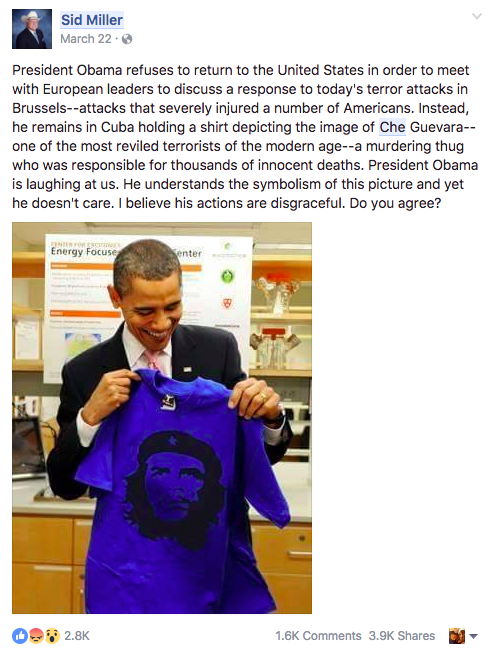 Obama displays Che Guevara shirt in Cuba Screenshot of Sid Miller Facebook post This photo is fabricated, Snopes notes. The original was taken seven years before Obama traveled to Cuba last March, and the shirt he held actually displays math jokes. 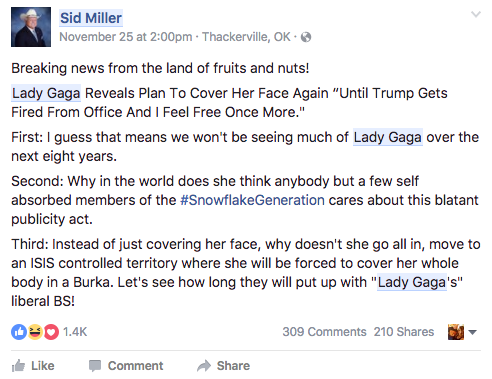 Lady Gaga plans to cover her face until “Trump gets fired” Screenshot of Sid Miller Facebook post Last week, Miller shared a headline from a website called TheRightists.com, which is more transparent than most about its fake news status. “This is a HYBRID site of news and satire,” the website says on its “About” page. “Part of our stories already happens[sic], part, not yet. NOT all of our stories are true!” Politifact notes that Lady Gaga never suggested that she would cover her face in protest to a Trump presidency. 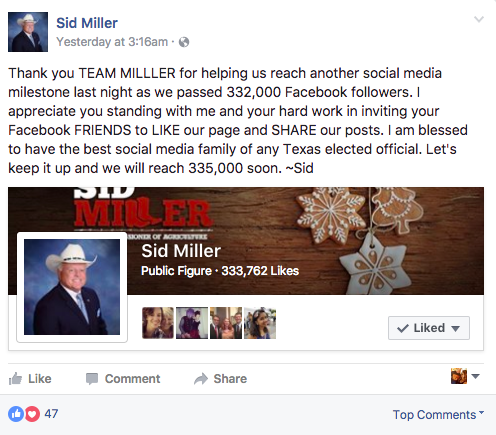 Nevertheless, Miller’s account decried the pop star’s “Liberal BS.” Muslims protest police and chant “praise Allah” at press conference regarding a beheading Screenshot of Sid Miller Facebook post More than two years after Miller shared this post, it was still on his Facebook page Friday, even after Snopes debunked its claim, as did — surprisingly — the Trump-backing website Breitbart, which Miller’s account often otherwise links to. While a woman was beheaded in Oklahoma, no Muslims protested at a press conference. A commenter on Miller’s post wrote: “They should have all been shot on sight!” Another wrote: “Kick these muslim idiots out of the country! They are NOT WANTED here." Miller’s account liked both comments. “Well, we have a tendency to like all the comments," Miller told the Tribune when asked about his apparent support of those comments. 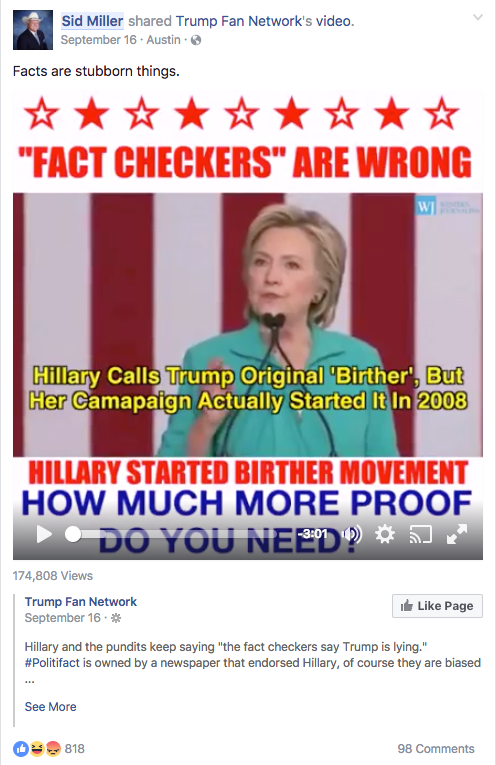 "We want everybody to be engaged.” Hillary Clinton’s 2008 presidential campaign kicked off the Obama “birther” movement Screenshot of Sid Miller Facebook post Miller shared this video last September. The notion that Hillary Clinton’s campaign first spread the false theory that President Obama was born in Kenya and therefore never eligible for the presidency has been debunked repeatedly over the years. Politifact explains that Clinton supporters appeared to have started the murmurs, but those Democrats had no ties to her campaign. 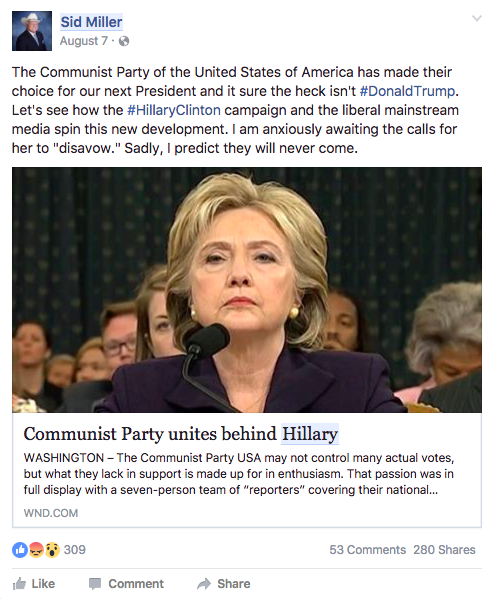 The U.S. Communist Party endorsed Hillary Clinton’s 2016 presidential campaign Screenshot of Sid Miller Facebook post Snopes rated this claim false, and it included a statement from the Communist Party that explicitly denied that it had endorsed Clinton or any candidates on the ballot. Miller shared the post in August. Hillary Clinton wants to “draft our daughters” Screenshot of Sid Miller Tweet Trump backers created the meme shared in Miller's October tweet as part of an effort to deceive folks into believing Clinton’s was campaigning on this message. Snopes has more details. Clinton has supported the idea that women should register for the draft as men do, while still backing the idea of an all-volunteer military. 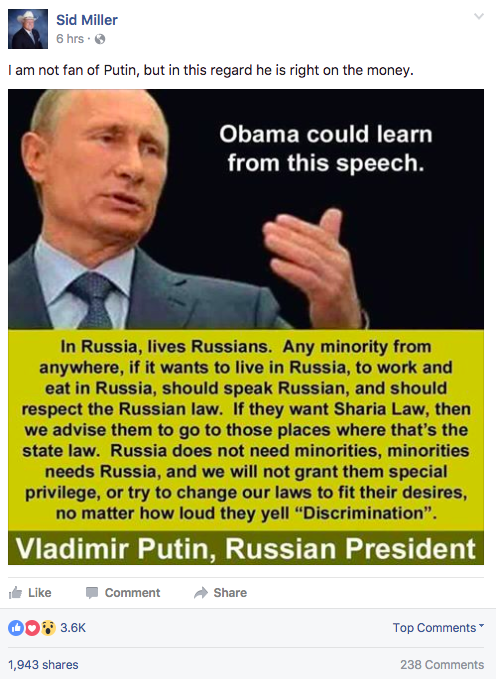 Vladimir Putin demanded that Muslim immigrants in his country speak Russian and completely assimilate to local culture Screenshot of Sid Miller Facebook post There is no evidence that Putin ever said this, according to Snopes. Miller posted the meme on Wednesday. 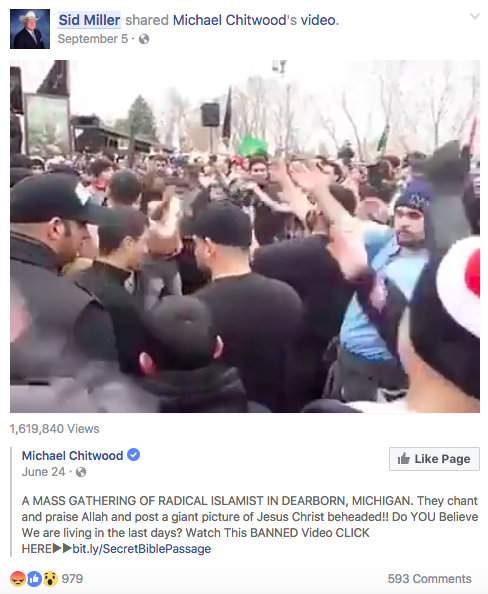 “Radical” Muslims in Dearborn Michigan rally around a painting of Jesus’ decapitated head Screenshot of Sid Miller Facebook post Miller shared this video this September, and it shows something very different what the post claims. “It captures a group of Shi'ite Muslims mourning the death of Imam Hussain at the culmination of a procession for Arbaeen,” a sacred Shiite ritual, Snopes details. Related coverage: A since-deleted tweet sent from Texas Agriculture Commissioner Sid Miller's account used an obscene term to describe Hillary Clinton. Miller's staff claimed he had been hacked, then apologized for a mistaken retweet. Lucy Nashed, communications director for Texas Agriculture Commissioner Sid Miller, resigned after the agriculture department gave contradictory reports on whether Miller had used state funds to compete in a rodeo. During his first year and half in office, Agriculture Commissioner Sid Miller's conduct ranged from the cartoonish to the potentially criminal. "On Sid Miller's Facebook, fake news flows freely" was first published at by The Texas Tribune, a nonprofit, nonpartisan media organization that informs Texans — and engages with them — about public policy, politics, government and statewide issues. Link back to the original article, which is located at https://www.texastribune.org/2016/12/03/texas-ag-chiefs-facebook-account-fake-news-flows/.